The Bead&Button Show is located at the Wisconsin Center in downtown Milwaukee, Wisconsin. Back by popular demand — We sold out the last two years, so be sure to reserve your seat early! Join two former editors from Art Jewelry magazine to learn about the latest jewelry-making trend in this playful, crash-course in powder coating. Using a simplified coating process of dipping instead of spraying the powder coat, you will learn how to easily add durable color to your metal jewelry. Theresa and Annie will also briefly introduce you to a fluidizing bed -- a simple tool that makes it easy to apply an even coat of powder on your metal. Learn how to prepare the metal blanks, apply the powder, and cure the powder to create a colorful bracelet, necklace, or an assortment of components to use in your jewelry designs. PJ Tool Jewelry Presents: Party After Dark! Create a bold pair of earrings that mimic the look of brass and copper in the daylight but come to life with vibrant, unexpected colors when the lights go off -- and learn how to powder-coat metal while you’re at it! Join two former editors from Art Jewelry magazine to explore their proprietary blend of glow-in-the-dark powder coat. Discover the joy of powder coating with a fluidizing bed -- a simple tool that makes it easy to apply an even coat of powder on your metal. 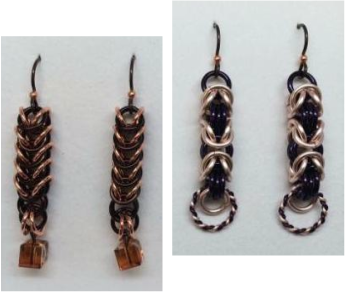 Learn how to prepare the metal, apply the powder, cure the powder, and then use sterling silver wire and simple wire-work techniques to create hangers and earring wires to complete the earrings. 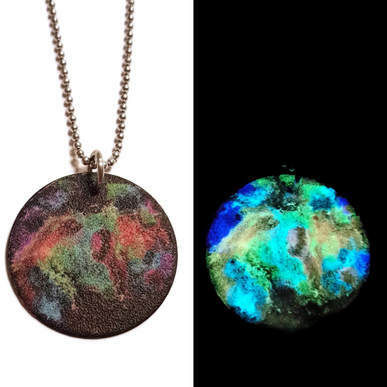 Create your own wearable galaxy that comes to life when the lights go off -- and learn how to powder-coat metal while you’re at it! Join two former editors from Art Jewelry magazine to explore their proprietary blend of glow-in-the-dark powder coat. This all-levels powder-coating class combines a simplified coating process with watercolor painting techniques to complete an out-of-this-world creation. Learn how to prepare the metal, apply the powder, and cure the powder to create a one-of-a-kind pendant necklace (or more, if time allows).. The Bead & Button Show is an intense 8-day jewelry makers adventure in Milwaukee, Wisconsin. Between the exhibits, demos, author events, gigantic marketplace and over 600 classes there is something for everyone. We've made some adjustments to our 2016 class, so in 2017 there will be fewer students, more time, and (thanks to ImpressArt) even more metal blanks! We sold out last year, so be sure to reserve your seat early. And to help with scheduling, we have two different dates available. Join two former editors from Art Jewelry magazine to learn about the latest jewelry-making trend in this playful, crash course in powder coating. Using a simplified coating process of dipping instead of spraying the powder coat, you will learn how to prepare the metal blanks, apply the powder, and cure the finished pieces to create a colorful bracelet, necklace, or an assortment of components to use in your jewelry designs. Be sure to check out the other fabulous metalsmithing classes that Annie will be teaching too! The Meet the Teachers Reception is your chance to meet the 2017 Show Faculty in an informal setting. Visit with your favorite teachers, get acquainted with others, and take an up-close look at the wonderful array of class projects being taught this year. If you find new classes you'd like to add to your schedule (and if seats are still available), stop by Registration (Wisconsin Center, 3rd floor) anytime Registration is open, and the Staff will be happy to help you. Teachers will be selling kits during the reception. The majority accept only cash or checks, not credit cards. "Maybe it was finger paint or perhaps crayons, no matter the medium, do you remember the first time you learned how to successfully mix colors? Recapture a bit of that same colorful magic by learning how to blend a color wheel's worth of jump rings into a playful, long necklace." We are taking this show to Knoxville, Tennessee. Please contact White Fox Bead Studio to reserve your spot for these classes! 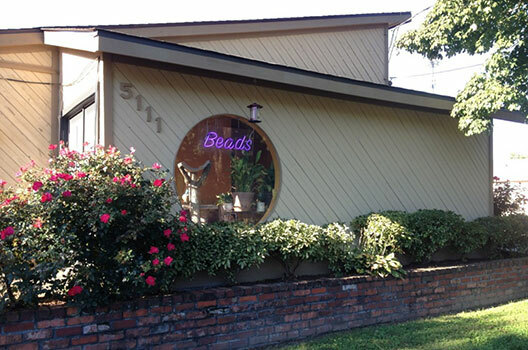 White Fox Beads is hosting jewelry artist Theresa D. Abelew for a day of classes! She's bringing kits for both of them, including those colored aluminum rings she uses in her book "Play with Chain Mail" — which she'll be signing! She's only here for one day and spaces are limited, so sign up ASAP. Price: $50.00 • Supplies included in class fee. A classic chain weave is going to get a twist in this class, where you'll be making several diamond-shaped pendants, in your choice of colors. Turn them into earrings or pick up a copy of Theresa's book to learn how to turn them into a bracelet. Or — I'm sorry — start making those handmade Christmas gifts. 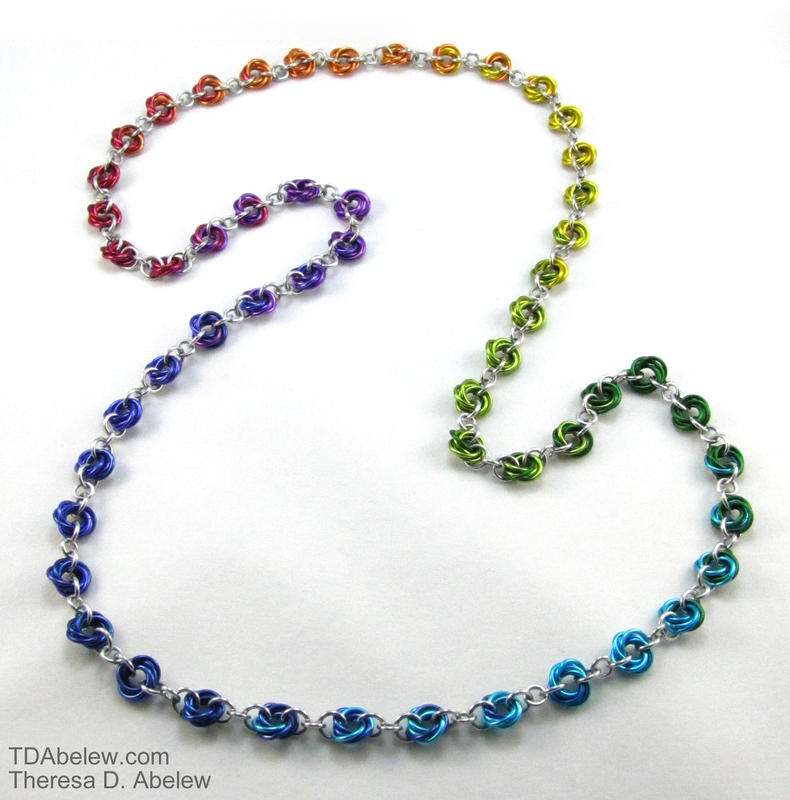 White Fox Beads is happy to be hosting jewelry artist Theresa D. Abelew for a day of classes! 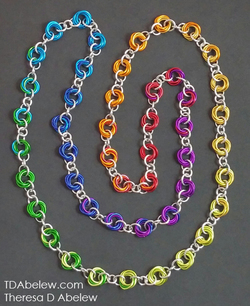 She's bringing kits for both of them, including those colored aluminum rings she uses in her book "Play with Chain Mail" -- which she'll be signing! She's only here for one day and spaces are limited, so sign up ASAP. Beginners welcome! The Bead & Button Show is an intense 13-day jewelry makers adventure in Milwaukee, Wisconsin. Between the exhibits, demos, author events, gigantic marketplace and nearly 700 classes there is something for everyone. It's been awhile, but I'm back to teach a whole new slew of classes for 2016! Maybe it was finger paint or perhaps crayons, no matter the medium, do you remember the first time you learned how to successfully mix colors? 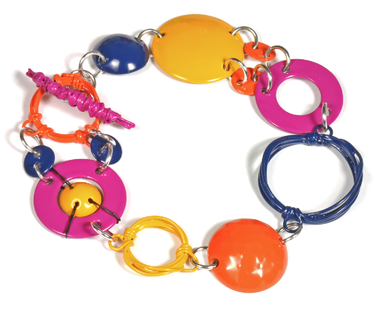 Recapture a bit of that same colorful magic by learning how to blend colored jump rings into a playful bracelet. Many jewelry authors will be on the show floor to autograph their books, and Theresa will be among them. Autograph your copy of Play with Chain Mail. Theresa can answer any questions you may have about chain mail and will demonstrate different chain mail techniques as time allows. Plus, every piece of jewelry featured in Play with Chain Mail will be on display! Join two editors from Art Jewelry magazine to learn about the latest jewelry-making trend in this playful, crash-course in powder coating. Using a simplified coating process of dipping instead of spraying the powder coat, students will learn how prepare the metal blanks, apply the powder, and cure the finished pieces to create a colorful bracelet, necklace, or an assortment of components to use in their jewelry designs. mail weaves, and the importance of choosing the correct materials. Modify a classic chain mail weave to create diamond-shaped components. Combine the components to create a chunky bracelet, or keep them separate for a collection of pendants (chains not included). 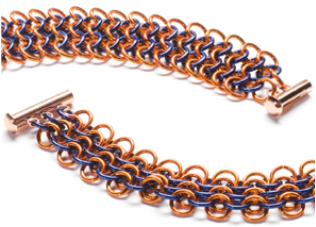 Learn how to incorporate metal scales to the classic Byzantine weave for a dramatic and sophisticated chain mail bracelet. The official kickoff to the 2016 Bead & Button Show and your chance to meet the 2016 Show Faculty in an informal setting. Learn how to combine two classic weaves into one chain mail bracelet that possesses both presence and sophistication.. Learn two chain mail weaves for one necklace. First learn a classic weave for the chain, then modify that weave to create a floral-inspired focal..
Maybe it was finger paint or perhaps crayons, no matter the medium, do you remember the first time you learned how to successfully mix colors? Recapture a bit of that same colorful magic by learning how to blend a color wheel's worth of jump rings into a playful, long necklace. Mix metals and jump ring sizes to weave a bracelet that mimics a gently meandering path. Do you like dimensional, and complex pieces of chain mail? 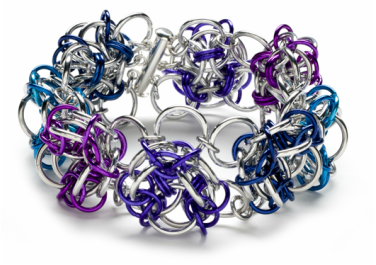 Join me on Sunday and learn how to weave multiple sizes of jump rings to make this show-stopper of a bracelet. Not into bracelets? The individual components can be worn as pendants or earrings instead. Sign up with Midwest Beads NOW! Looking into trying your hand at chain mail? For some, the thought of weaving a giant pile of jump rings into an entire necklace, or even a bracelet, can be daunting. Take the anxiety out of chain mail with this quick sampler class. You'll learn about the relationship between Box and Byzantine weaves, and weave two pairs of sophisticated earrings. The 4-in-1 weave was a popular choice for medieval armor. The flexibility of this weave allows it to be woven horizontally or vertically, giving it two distinct looks. Learn both variations as you make these fun bracelets. Fee: $21 does not include kit. There are no materials included for this class--the selection is up to you! When you sign up, you’ll receive a list of materials, as well as a 10% off coupon for class supplies.